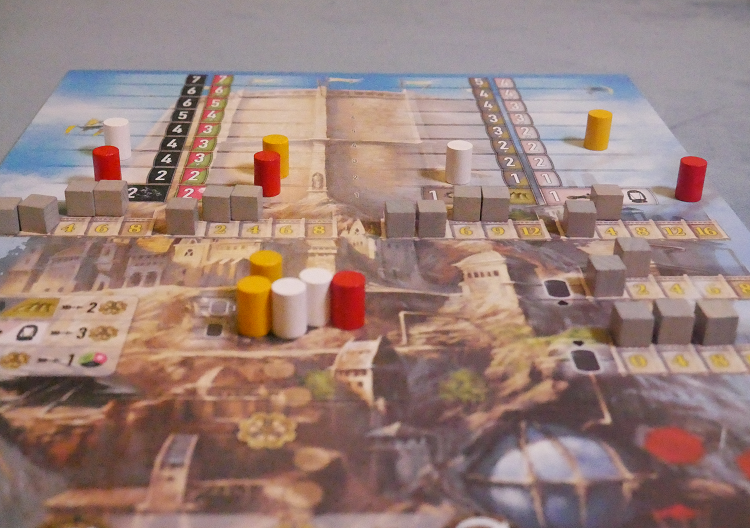 Noria is the debut title from Sophia Wagner, who won the Spiel des Jahres fellowship in 2015. This Euro-style game revolves around gathering resources, building factories, and producing goods, which we’ve seen in many other games. What makes Noria truly unique is its innovative wheel-building mechanic. Each player has a three-tiered wheel in front of them. At the beginning of the game, the wheel is populated by a few discs and lots of empty spaces waiting to be filled with more discs. Those discs allow you to do a variety of different actions. When your turn begins, you can only activate the discs that are in the lower half of the wheel. What’s more, you can only activate up to three discs at a time, one per tier. And those discs must be adjacent to each other. The discs can be activated in any order. So you don’t have to activate them from the top down. You could activate the bottom tier, then the top tier, and then the middle tier. But all three of those tokens need to be adjacent to each other. At the end of your turn, you rotate all of your wheels one click. As you go through the game, you are building up your wheel, collecting resources, and building ships and factories. Those factories produce goods that you can spend to move up the paths of different projects. At the end of the game, you will score points according to how far along you are on the project tracks. The rules of the game are pretty intricate, so I won’t go into them all here. It’s a lot easier to understand the rules if someone is explaining them to you with the help of the board itself. Check out the rules video below from Edition Spielwiese. The wheel building mechanic is unique and awesome. I’ve never encountered something in a game quite like this. What makes it great is it forces players to make a lot of hard choices. The first of many hard choices is where in your wheel you want to place new discs. The way you build your wheel will determine what actions you can take, and it will determine the frequency you can take those actions. If you build them in the top tier, you’ll be taking that action every other turn. Build it in the middle tier, and you could potentially do that action twice in a row. But then that action will be unavailable for the next two turns. The bottom wheel is an even more sprawling affair, offering even more complicated possibilities. Besides the choice of placement, you also have to plan multiple turns ahead. You can look at your wheel and know exactly what actions you’ll have available to you the next turn. You’ll need to carefully plan out your turns to make the most of your action discs. What makes it even more complicated is that you can also upgrade your discs. When activated, upgraded discs allow you to do that action twice. But you’ll need to think carefully about what you’re upgrading. Even though you can activate up to three discs per turn, you can only take a total of four actions. So if you activate three discs and two of them are upgraded discs, you can actually only utilize the extra action of one of those upgraded discs. But there’s even more to consider besides just the intricacy of your wheel. You also have the ability to affect the worth of the four different project tracks. You are able to both make tracks score more points at the end of the game and make other tracks score less points at the end of the game. You’ll want to be watching carefully for when other players are affecting your tracks, and you’ll want to negatively affect other players project tracks as well. There’s even more meat to this game, involving the collection of resources, the building of factories, and the production of goods. I suggest playing a practice game in order to get a handle on how everything works together, and then attacking the game again once you’ve gotten used to the way the wheel works and how the different actions chain together. 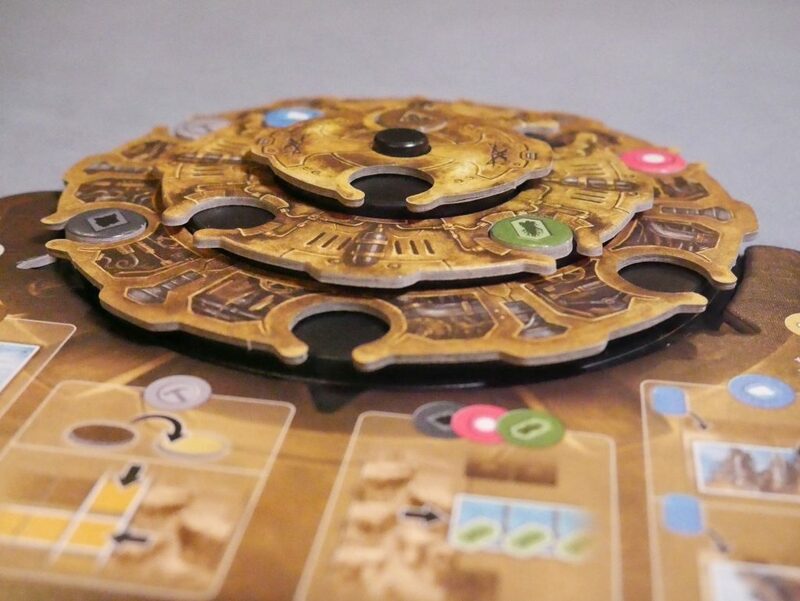 Noria is an intricate, brain-bending game that is a ton of fun. The first time I played, I had to constantly be turning over all of the different actions I could take in my head, along with attempting to plan out my moves ahead of time. It took me most of the game to figure out how everything connected and worked together. 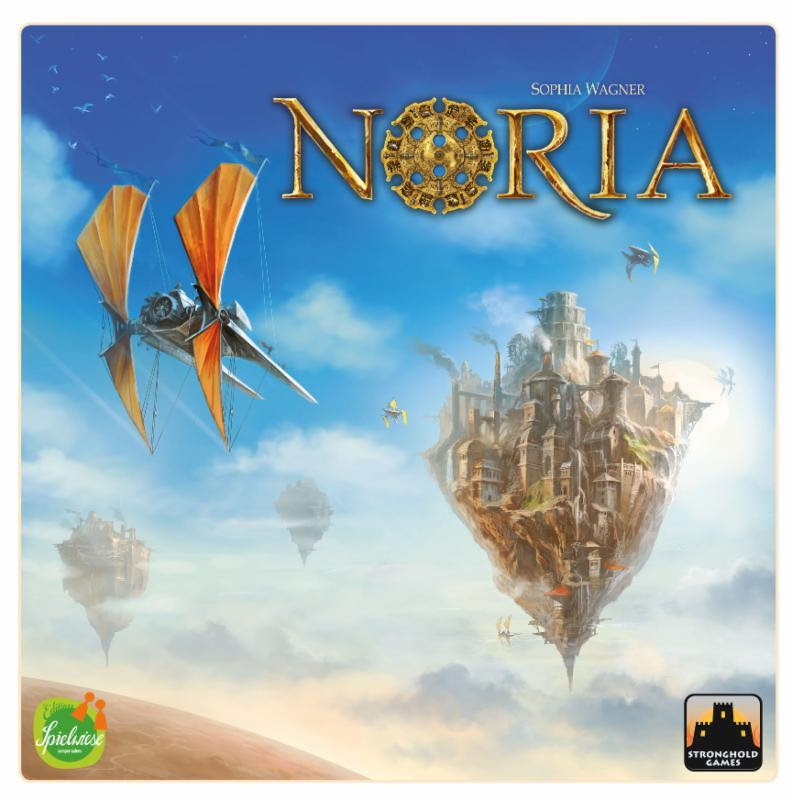 There is a ton of depth and variability to Noria, and I enjoy playing it very much. There’s no one perfect way to play. Each time will be a bit different, depending on how you build your wheel, what resources and factories you choose to build, and what tracks you focus on. If you are looking for a challenging game that’s unlike any other, definitely check out Noria. It is for 2-4 players, takes about 70-120 minutes to play, and costs $79.95. It’s not currently available in the United States, but it should be available soon from Stronghold Games.